Does your bank have the feelgood factor? Are banks providing business funding support for SMEs? 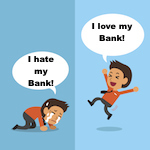 Let’s face it: the words “bank” and “feelgood” don’t often tend to appear in the same sentence! But recent research by YouGov provides sad confirmation that 26% of small businesses do not feel supported by their banks. YouGov surveyed 500 SMEs in research commissioned by P2P finance specialist Nucleus Commercial Finance. They found that the dissatisfaction is felt most deeply by those businesses turning over less than £1m. Over 30% of such businesses claim to feel unsupported by banks in terms of how they are treated regarding business funding. The reason for this lack of notice is the unwillingness of banks to consistently make unsecured lending available to small businesses. Because SMEs are likely to be their least profitable business customers they therefore become the lowest priority customers in terms of business funding. Latest figures from the Bank of England indicate that the amount of SME overdrafts has fallen by around £8.5bn in the last four years. In the first quarter of 2016 the overall amount of small business funding - in terms of both business loans and overdrafts - was £6.1bn: 18% lower than in the same quarter last year. At Fair Business Loans we understand the business funding needs of SMEs, particularly in these uncertain times. We agree with Chirag Shah that small businesses need to assess all their finance options to ensure the future success of their business. We urge small businesses to seek business funding from financial organisations that are truly supportive and will treat them fairly. If that is the kind of lender you are looking for in these difficult times then why not get in touch with us at Fair Business Loans and see what we can do to help you.